Are assassinations lighting Atlantic Canadian homes? 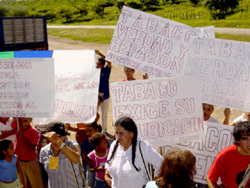 Residents of the Colombian village of Tabaco protest the imminent demolition of their village. 500 soliders and 200 police officers forcibly evicted the residents before bulldozing their homes in 2001. The villagers have demanded that their village be relocated as a whole. In the past, the mining industry has played an important role in Nova Scotia, both as a source of jobs and as a part of local culture. Today, due partly to the low price of coal on the world market, Nova Scotia Power (NSP) and New Brunswick Power (NBP) rely on imported coal for electricity generation in the region. NSP in particular relies upon coal for 80% of its power generation. NSP and NBP are the only two companies in Canada that import coal from Colombia, a country known for massive human rights violations against labourers within its mining and petroleum sector. Canada Steamship Linesa company formerly owned by Prime Minister Paul Martinis currently transporting coal mined from La Loma and El Cerrejón mines in Colombia to be fired in NSP plants. A new campaign undertaken by the Atlantic Regional Solidarity Network (ARSN), a Maritimebased Latin American solidarity coalition, is working to focus the attention of people in the Atlantic region on the human and environmental costs behind their monthly power bills. "The 'Mining the Connections' campaign began after the ARSN annual meeting in December last year," says organic farmer and ARSN member Steve Law. "We discussed the idea of solidarity which we could bring to the situations faced by sisters and brothers in these two countries [Guatemala and Colombia]." In its 23-year history as a Latin American solidarity organization in the Maritimes, ARSN has had particularly close ties with Guatemala. The Mining the Connections Campaign is also focused on the actions of Glamis Gold Incorporated, a Canadian mining company operating an open-pit mine in Guatemala. Community organizations in Guatemala are accusing the company of complicity in human rights and environmental abuses in the region. Francisco Ramirez, the head of the National Mineworker's Union in Colombia, conducted a speaking tour of the Maritimes organized by ARSN last March. He was accompanied by Jose Manuel Chacon, a political cartoonist and environmentalist from Guatemala. The two travelled throughout the region speaking about the culpability of Canadian mining corporations in human rights abuses in both Colombia and Guatemala. Ramirez in particular, in speaking about the connections between Maritime power utilities and labour rights violations in Colombia, received a great deal of attention. "The tour we organized went from Cape Breton where we met with government officials, Mi'kmaq community members, [and] university students. In New Glasgow [Nova Scotia] we held a memorial at the Westray Mine memorial with family members affected by the Westray disaster. In Sackville they met with university students and community members. In Fredericton they met with labour leaders from the International Brotherhood of Electrical Workers (IBEW), MLAs as well as MPs. In Halifax they met with community members, IBEW Locals, international development leaders as well as MLAs, and MPs," said Law. Absent from this list were representatives from NSP itself. Although ARSN attempted to arrange meetings between Ramirezwho has been active with unionized miners in the mines from which NSP buys its coaland NSP officials in December and in March, NSP officials have refused to meet. During Ramirez's visit to the region in December of 2004, he was informed that NSP only dealt with corporate representatives and did not get involved in human rights issues in other countries. According to ARSN, both NSP and NBP purchase coal from La Loma and El Cerrejón mines in Colombia. El Cerrejón mine is currently the world's largest open-pit mine, spanning 50 kilometres in length and 8 kilometres in width. It was initially started in the 1980's as a partnership between Exxon-Mobil and the National Colombian Mining Company. In March of 2002, as a result of IMF-imposed free-market policies, it was sold to a consortium made up of Anglo-American, BHP Billiton and Glencorethree of the world's biggest mining companies. The expansion of this mine has displaced a number of Colombian communities, most recently the village of Tabaco. In 2002, the village of Tabaco was destroyed and its inhabitants, most of whose Afro-Colombian descendants had lived in the community for generations, were attacked by more than 200 soldiers and police. Alabama-based Drummond Corporation, the owner of La Loma mine, is currently the subject of a lawsuit being pursued by the United Steelworkers of America, as well as the International Labor Rights Fund. The suit alleges that Drummond directly hired paramilitaries who assassinated three labour leaders within the La Loma mineworker's union. Margaret Murphy, a representative of NSP, who was personally asked to arrange a meeting with ARSN members, claimed that NSP had not been approached with specific evidence of the abuses in question. "None of these groups...have brought forward any specific information to us about these allegations," she said in a phone interview. Murphy also argued that it was unfair to make generalizations about the mining industry in Colombia, and added that NSP only dealt with reputable companies in its overseas purchasing. At press time, officials from NBP had not returned calls. Catherine Hughes, another ARSN member based in River John, Nova Scotia, noted that ARSN members - as well as Ramirez himself - have as-of-yet not been given an opportunity to present their information about the connections between NSP and NBP's suppliers in Colombia. "We certainly haven't had a chance in a formal manner to present this information to them," she said, but added that NSP has recently indicated a willingness to speak to ARSN members. Colombia has the highest rate of assassinations of labour leaders in the world. Ramirez himself has faced no fewer than seven assassination attempts, the most recent of which occurred as he was walking his daughters to a lunch counter in Bogota. Ramirez worked personally with the union leaders within La Loma mine, and had been leading a union campaign against the privatization of Minercol, the state mining company. During his presentation in Halifax, he claimed that there are enough co-operative mining operations throughout Colombia, which respect the basic rights of workers, to provide for the needs of both power utilities in the Maritimes. "NS Power should be moving toward renewable energy sources," said Hughes, echoing a familiar refrain among environmentalists in Nova Scotia. "But if the coal is to be purchased from Colombia, it should be purchased from sources with basic respect for the environment, and for labour rights." Did Canada Help Dismantle Sri Lanka’s Peace Process?